Kwame’s bookshelf is a lovely book review blog, run by Erica Campayne. In focusing on reviewing children’s books with black and/or disabled main characters, it shines a spotlight on books which are often overlooked by mainstream reviewers, but which are absolutely essential so that every child can see themselves mirrored positively. LR: How did Kwame’s Bookshelf come about – can you say something about the inspiration behind it, please? EC: As an adult I was already conscious of buying books by authors from a range of ethnicities, so I took that sensibility with me when shopping for my child. I realised quite quickly that I had even less choice for books than in the adult sections. And I knew that I would be sharing these special moments reading to my new child and presenting ideas to him about the world – I didn’t want one of those ideas to be that he was unusual by showing him books that didn’t feature him. I wanted him to see himself as wonderful and vital and a connected part of the world around him. We also have disabled family members and I wanted to have that included in books as a way of my son and I exploring these ideas. I wanted to include books on his bookshelf that reflected our loves alongside all the other books. I wanted him to have a bookshelf filled with books that showed a range of ethnicities and stories. So I started Googling but wasn’t coming up with many options, and I also started asking family and friends to suggest books, most of which were by African American authors – which is fine, but I realised there was a real lack of books about British kids of a range of cultures. At about the same time I listened to a podcast which stated that an entrepreneur is someone who presents a solution to a problem (and of course monetises it). I don’t think I’m an entrepreneur but I realised that this was the problem I had – finding books that featured lead characters (not just a brown face in a crowd scene) that were from a range of ethnicities and also featured disabled characters. I couldn’t find a list like this when I Googled so I thought I should therefore make one. As Maya Angelou says, if you can’t find the story you want to read, you need to write it. I’m not a writer but I am a connector. So I thought I’d connect the writers of these books with people like me who want to read and purchase them. LR: Do you feel that it is important to children to see themselves in fiction, and if so, why? EC: It’s so important. In every culture the stories that are contained in books are used to teach children facts but also societal values, such as to share, to love their family, to overcome fears and dangers…so black, asian, turkish, and children with disabilities should be part of this narrative. Not just for the benefit of children from those backgrounds but also to help other children empathise and realise that there are other experiences in the world or to connect and realise that they share similar experiences to other children, e.g. no one wants to go to bed and miss out on the fun! LR: Did you feel reflected and represented in children’s books when you were growing up? If not, do you feel this absence was a problem? EC: I know that my mum made a conscious point of buying me toys and dolls that featured black children, we had some sent from family in America and we read a wide range of books. I also attended Saturday school which is a supplementary school for black children where alongside maths and english you were taught black history. So there were lots of other inputs. But I decided to set up Kwame’s Bookshelf when I realised that I was still hunting for books with black lead protagonists in the same way that my mum was over 30 years ago! LR: Do you feel seeing Black and disabled authors is also important to child readers? EC: Yes – it’s important for all of us. We can’t continue to shape the world into one mould. In this connected world of the internet where children will encounter so many more perspectives on life, they need to know about that and navigate that. In the way that CBeebies successfully shows how you can offer depictions of all sorts of families, literature needs to catch up. LR:If you could pass on just one message to publishers of children’s literature, what would that message be? EC: Increase the richness of the books on offer. Nurture UK based writiers who want to create these books and be bold and confident that they will reach a large audience. Just like the fantastic Megaphone programme that you ran and which I got to hear extracts of the work that was created. The talent is there but more effort needs to be made to support it. This isn’t just an issue for families from diverse backgrounds, my white friends also want to buy books for their children that reflect the lives their children grow up in – especially in somewhere like London where I live. And with the way the world is growing so divisive let’s try and set a different tone for the children who will take over from us in the future. What especially stands out to me from what Erica said, is the fact of having to consciously look for picture books with black and disabled protagonists. In contrast, one doesn’t have to consciously look for books with white and able-bodied characters; they are easily and widely and immediately available in mainstream shops. Finding black and disabled characters in picture books is simply much harder work, and it shouldn’t be. Everyone deserves an equal place in literature. And if you’re a publisher or author with a suitable book, why not send her something to review? Adam’s grandfather has died, and his family feels broken. But then a strange man with a scar on his chest appears at the door and walks into Adam’s life. William is the recipient of Adam’s grandfather’s donated heart, and something has drawn him to the grieving family. As events unfold, and the secret tragedy of Adam’s family is revealed, it becomes clear that though William has been healed by their loss, he has healing of his own to give. Irfan Master’s first YA novel, A Beautiful Lie, dealt with events in India in 1947, during Partition, and was widely recognised as an impressive literary debut. His second novel, Out of Heart, explores different territory but with the same memorable style. This is the story of a contemporary British Asian family who heal through graffiti, hearts and a mysterious link with a stranger. Inventive use of form lifts this above the standard novel. Adam, the protagonist, is a strange, artistic boy but the real reason for the darkness he carries around with him isn’t revealed until half way through the novel. This is a magical realist novel about a family healing as well as about a teenage boy exploring his different father figures – all flawed in some way. It is also a moving exploration of the hurt that is passed on through families, of the inarticulacy of conventional masculinity and how that hampers emotional closeness, and about the controlling, demanding aspect of community. It’s also an insight into contemporary Pakistani-British family life; something that’s rarely written about in children’s or YA literature. I found plenty that was familiar to me from life, though not from literature, in the story; not least the complex relationships between generations in a family whose heritage is overseas. Irfan Master has been good enough to answer some questions for us, giving us an insight into his writing process and his views on supporting BAME children’s and YA authors. LR: I enjoyed the magical realism element of OUT OF HEART, by which I mean the connections the characters have with each other through dreams; how did this come about? Did you begin with the idea that you wanted to write magical realism, or did it evolve as you wrote from the characters outwards? Out of Heart by Irfan Master. Published by Hot Key. LR: I also very much liked the form you chose, and the meditative feeling it creates by varying the pace. How did you decide on the form (traditionally-written chapters alternating with short statements and facts about the heart)? What challenges and opportunities did you find when writing in this form? IM: The whole book, in my mind, exists in a vacuum, of symbolism and metaphor and I think the short statements were markers for that. I wanted that elegiac, meditative tone for the book from the outset and each chapter start gave me that. I really don’t know how the reader will feel about them, but I really like them! I think the first heart statement in the book, about the size of your heart being the size of your fist, was significant, in that it was a direct reference to something Adam has an idea about with his graffiti and because in my mind the clenched fist is an act of protest. An act of defiance, and I feel that is what Abdul Aziz Shah is doing by donating his heart. As for challenges, well, finding a bunch of interesting heart facts was one! And then rewriting a few so they sounded poetic or poignant was another. I didn’t set out to take so many risks, if they can be called that, with the form for this book, but I did want to try a few things: The two William Blake poems as bookends. The drawings as signifiers for each character at the start of chapter. The heart statements. The word play by Adam to make sense of the world. The free verse parts for Abdul-Aziz Shah, Farah and Adam. The dot-to-dot references and the image at the back of the book. These were all extras, as it were, to try and lift the story into the sky alongside Icarus and Adam. LR: What was it about the topic of heart transplants that first attracted you – did you begin with the topic, or did you begin with the characters? IM: Always the characters for me. Always a snippet of conversation, or a chance meeting. I usually note these exchanges down and wait for things to come back and nudge me. I do remember a conversation with an old Pakistani man on a park bench: He was clutching his chest and I asked in Urdu if he was OK. He was very impressed that I could speak Urdu and so was happy to chat. He explained he’d had a heart transplant and that he felt odd and like a different person. Not good or bad, just different. We chatted a little until I saw on the path, a young woman, a little girl and a tall boy in a black hoody. They came and collected their Dadda, lifting him to his feet and led him away, the little girl waved at me and skipped happily behind them. I stored all of that away, and with a few tweaks, that became the Shah family. As for heart transplants. I was just fascinated about this incredibly powerful and muscular engine-like organ in our bodies, but even more than that I read some articles around “heart transplant tendencies”. That is, the receiver of the heart acquires a taste for say, chocolate or poetry or Jazz or cycling, something that was new to them. The articles followed up with the donor family and found the donor had also liked these things, in some cases obsessively. I found this fascinating especially as Doctor’s couldn’t really explain how this might happen. The heart is not a repository for emotions and memories. Historically we’ve always equated the heart with emotion and pain and feeling, but this has no scientific basis. So, I was really intrigued by this and wanted to use it in a story with a particular focus on two very different men from very different yet still diverse backgrounds. LR: You explore topics that are sometimes hard for people to acknowledge in real life; the controlling nature of immigrant communities, for example. Do you think books have a part to play in bringing this kind of topic into the open? I think immigrant communities can be wary of self-critique because they feel very much criticised from outside, so feel they have to ‘stick together’ and the down side of this can be that real problems aren’t addressed. What is your feeling on this? Are there particular topics you think are important to address in books? IM: I think all topics should be there for writers to address. The importance to the writer can be personal or functional depending on the writer and what she/he has in mind for the story. For Out of Heart, I was led by the story, and the central characters and that’s how it came out. Addressing the domestic violence in the book for instance, and let’s be honest, it’s hard to sugarcoat that, so I don’t. That chapter is hard to read. But at no point do I intimate that this is a problem for immigrant communities only. I think some elders in the community that I come from might think I’m painting the community in a bad light, but I am writing from within about a community I know quite well rather than from outside looking in. I’ve worked in various community settings and my Mum is a Family Support Officer at a local Sure Start Centre in a very mixed community ranging from white working class to immigrants from the old country in Pakistan, Afghanistan, Albania etc. We’ve had lots of conversations about the complexity of the communities we know and those we don’t. She’s seen firsthand what happens if people don’t come forward to address the issues. We are extremely complex third and fourth generation communities with a host of issues that afflict us. The same as everybody else. Our kids and families access social workers, visit counsellors, go to drug rehabilitation, use birth control, suffer from anxiety and depression, get divorced, have children out of wedlock, have gambling addictions and marry out of their cultural group. I never set out to write a story about singular topics, but rather a story around themes of redemption, grief and family relationships. I feel they are universal themes and my hope is they can be accessed by all. LR: Moving on to the focus of Megaphone…Do you feel we need more support for BAME children’s and YA writers in Britain? What sort of support do you think is most needed, if so? What changes and developments would you personally most like to see? IM: I definitely think we need more support for BAME writers particularly in Children’s and YA. Mentoring will always be a progressive way to nurture new writers or writers looking to be published. Clearly, Megaphone does this so brilliantly and has already become a reference point for BAME writers, published and unpublished. I also like the fact that Megaphone isn’t London based. As a writer born in Leicester, I think this helps widens the pool to writers from around the country and would definitely have tried to access Megaphone if it had existed when I started out. I do believe this trend to move outside the capital will continue as London becomes more expensive, competitive and in many ways over saturated with publishing houses. It feels like a lot of Independent publishers based outside of London are winning major awards and publishing a more varied list and this can only be good for the industry. There are BAME writers out there. Some established, some breaking through. Question is are they getting the publishing deals? If not, why not? If so, are they under pressure to write the book the publisher/industry/editor wants? Does that mean they sell out? How much diversity are we talking with regards to subject matter? Are they getting a decent publicity spend? Do publishers understand what they have in a BAME writer writing stories from a uniques perspective? Are BAME writers too black or too asian or just too much for publishing? I think these questions still hover over the industry, the difference is a lot more people are asking them. There has been a lot said in the last few years about publishing not being diverse enough, and it does feel like publishing in general has taken this on board. Influential BAME writers, bloggers and commentators on social media can now ask publishers to defend their position publicly, especially with regards to awards and their publishing lists. After years of being overlooked for prizes and not being booked for festivals you now have the Jhalak prize and the Bare Lit Festival. BAME writers and supporters can only wait so long for change to happen until we take things into our own hands and I think Megaphone coming into existence is also symptomatic of this. Real change has to be systemic, not just at editorial level or publicity and marketing level but a deeply embedded recognition by the industry that more diverse books, more wider representation can only help a society grow. That publishing diverse stories helps create empathy, helps BAME communities feel more a part of the what it means to be British, broadens the narrative to more than just the one story, helps young people from BAME communities feel that they too can be the main protagonists in popular books and moves the conversation away from the bottom line of profit margin, commercial success and well worn tropes and trends that have been prevalent in publishing since the 50s and 60s. The day Megaphone isn’t needed, is the day we can say, there isn’t a problem with publishing, not only in this country, but around the world. LR: And finally, what are you planning to write next – is there a book in the pipeline? IM: Yes there is! A story set in the court of Queen Victoria about two Indian boys sent as observers/spies A kid of subversive look at all the issues of colonialism through the eyes of two highly intelligent, sophisticated characters who arrive expecting the seat of a glorious empire only to find an oppressive feudal system in place and a country that is neither more civilised or advanced than their own homeland. LR: That sounds amazing! Thank you so much for answering these questions. I’m interviewing the first ever Megaphone participants, giving those who follow the blog and have an interest in Megaphone an insight into the people who’ll be on the scheme. Today, Danielle Jawando tells us a bit about herself and her writing and her hopes for Megaphone. Leila: Can you tell us a bit about yourself and your writing life so far? Have you been writing long, and what drew you to writing for children and teenagers? Danielle: Writing and books have always been a huge part of my life. In fact, most of my childhood memories include reading or scribbling down some form of story or the other. Although writing has always been something I’ve done, I never realised I wanted to be a children’s author until much later on. True to form, English was my favourite subject at school and I then went on to study a BA and MA in Creative Writing at the University of East London. For me, this was one of the most significant turning points in my life. I’d never really been around other writers, or people who loved words as much as I do. So those years spent analysing craft, exploring narrative, discussing theory and questioning what it means to be a writer, made me realise that this was what I wanted to do. I then went into teaching, and taught a mixture of English GCSE, Functional Skills and Creative Writing in an FE college (along with running various writing workshops within Hertfordshire.) On the rare occasion I didn’t have marking to do, or lessons to plan, I would stay up and write. But I found that I just didn’t have enough time, and when I wasn’t writing, that’s all I could think about. Although I enjoyed teaching, deep-down I knew that I was writer, and the less I was able to write the more miserable I became. For me, writing wasn’t just something I enjoyed, it was a necessity. When I didn’t write, I felt disconnected. Lost almost, and I knew then (that even if nothing came of it), I had to finally do what I’d always wanted. I began sending stuff out and the good old rejection cycle started. Then, at 23, I had my first short story published by Deadink and NAWE, not long after that I found out I’d been shortlisted for an Original Voices scheme with ITV and Emmerdale. After several very close calls (and countless no’s), I finally left teaching in May last year, to start storyline writing for Coronation Street. I worked on Corrie for seven months and during that time, I also wrote a few short plays, one of which was put on with a local theatre company. I’m currently in the process of developing a full-length play (‘O’Donoghu’s Wife’) which will be touring next year. But I guess, through all of this, the one thing I’ve been desperate to do is to write children’s fiction. When a close friend of mine sent me the Megaphone application last year and I read about the scheme, I knew I had to apply. I was thrilled when I found out I had been chosen as one of the five participants. I guess the first thing that drew me into wanting to write children’s literature, is my love for children’s books. I think that some of the most wonderful stories, important messages and pressing accounts of society and the human condition, come from children’s literature. Of course, having taught would undoubtedly come into this. I feel that as generation after generation evolves, so does the need for new stories. I think as writers, we owe to the world to constantly look for new perspectives, new narratives and new ways to have those important conversations. It’s an exciting time to be a children’s author, there’s even more of a shift in boundaries, in censorship, in diversity and in voice. Finally, I’ve always found the way children and teenagers see the world fascinating. Perhaps it’s that balance of innocence and experience, or that element of truthfulness that children so often possess. They tell you how it is, they look at things and when something isn’t right, they speak out. Either way, all of these things have contributed and Megaphone is something I’m very much looking forward to being part of. Danielle: The novel I’ll be writing, I’ve had in my mind for about four years now. I was coming to the end of my Masters and was writing my thesis on the representation of mental illness within literature and the effects that institutionalisation has on voice (One Flew Over the Cuckoo’s Nest is one of my favourite novels.) I read a lot of Foucault, Laing and Goffman at the time, and I was both disturbed and fascinated by the history of mental illness, and the way in which society treated those who they perceived to be ‘mentally ill’ at the time. Another significant influence was Laing’s The Divided Self, in which Laing provides detailed accounts and case studies of what ‘schizophrenic and schizoid’ patients. Laing’s main purpose was to describe the decent into madness in a comprehensible way, allowing others to understand the transition between the ‘sane schizoid way of-being-in-the-world,’ to the ‘psychotic way of being-in-the world.’ Laing then goes on to discuss, how the term ‘schizoid’ often refers to an individual who is “split in various ways.” An already “shattered humpty dumpty, trying to exist in the world.” These images really stuck in my mind, and from those bits, all of these questions started to form. It made me wonder how someone born into such a controlled and institutionalised society, where madness is this disease of civilisation, would cope? It also made me wonder what it would be like for this person with this shattered sense of self, a core they’re constantly trying to piece together, would cope? From that, my novel and my characters were born. My protagonist, (Nathan) is a teenage boy with this divided and split sense of self, almost like a Rubick’s cube he’s constantly trying to piece together. I then began to think about other aspects of his life, his mum, his brother, his younger sister and those relationships around him. The novel is going to be a split narrative, with two parallel points of view running along side by side. One point of view is going to be told from Nathan’s perspective (who is institutionalised and perceived as being ‘mentally ill’), and the other point of view from his brother, Sol (who is perceived by society to be sane.) It’s not just about this depiction of mental illness and the effect of institutionalisation, but I also want to show this ‘transition’ in a comprehensible way. For me, this story is also about those murky bits in-between. How a young boy with this divided-self experiences the world, how his relationships are effected, how he grows up. I’m really interested in those grey areas, which so often bleed into every aspect of our lives. Some of the challenges I know I will face, will undoubtedly be research. For a novel like this, I think it’s important to not only get the critical and theoretical research, but also the experience from those what have worked within the mental health profession. I’m still playing with the idea of my novel being set in a dystopian universe, but either way, I want it to seem real, truthful and believable, so research will be a significant aspect. As my novel is also a split narrative and will have two parallel points of view, another challenge will undoubtedly be the structure and the distinctiveness of both voices. I think I’ve managed to accurately portray the voices of teenage boys (years of teaching construction students have definitely helped that), but my challenge will be in keeping them separate and distinct. I’ll definitely have to embark on some thorough planning. Finally, with most things in life, I don’t want this novel to be as clear cut as this is ‘reality,’ this is ‘fantasy,’ this is the voice of someone who is ‘mentally ill,’ this is the voice of someone who is ‘sane.’ As I’ve mentioned previously, I’m very much interested in those grey bits in-between. I’m hoping to write something that will consistently have my readers questioning their perception on sanity, but also society’s perception on it. Through it all, I want them to understand, experience and feel what both brothers are going through – which I know will be a challenge! Danielle: A lot of my friends are either published writers, or in the process of sending out their manuscripts and the one thing they always tell me, is how difficult it can be to receive critical feedback from an editor or agent. One of the wonderful things about Megaphone is that it opens up the direct channel of communication to editors and agents. There are so many experienced people involved, from Leila Rasheed to the countless editors, writers and publishers who have volunteered their time. One of the things I’m hoping to get out of Megaphone, is that crucial experience and advice from industry professionals. I’m excited to attend the masterclasses and I’m also excited to learn, from everyone who is involved in the scheme. Another thing I’m hoping to get out of Megaphone is a good support network of friends and writers. Writing is such a lonely feat. You spend most of the time in your own head, or locked away trying to get your ideas down. It’s one of those jobs where you are constantly doubting yourself and sometimes can’t see the wood through the tress. I think it’s so important to have a group of fellow writers who you can trust and share your work with (especially in those early stages, when things are still raw.) Another great thing about the scheme is that there are four other people going through the exact same process as myself. So we will be able to support and encourage each other along. We’ve already been in contact (although we haven’t yet met), and have shared book recommendations and the writing samples which we submitted during the application process. I’m hoping that long after the scheme has ended, we will all be in contact. Finally, without meaning to state the obvious, I’m looking forward to writing my novel. Aside from all the wonderful people I’ll meet and the wonderful things I’ll learn, I can’t wait to have my finished manuscript. I’m interviewing the first ever Megaphone participants, giving those who follow the blog and have an interest in Megaphone an insight into the people who’ll be on the scheme. Today, Avantika Taneja tells us a bit about herself and her writing and her hopes for Megaphone. writing is very much intertwined with my relationship to the city. distilling complex social issues into age appropriate stories. arriving at a new ‘home’ – be that a place or a renewed identity. Benjamin Zephaniah and Michael Morpurgo. conflict within the story, without employing a ‘teachery’ voice. writers on a similar journey. to a​ world that sometimes seems impene​trable from the outside​. way to turn a passion project into a reality. Peter Kalu is a poet, novelist, playwright and script writer. He started writing as a member of the Moss Side Write black writers workshop and has had five novels, two film scripts and three theatre plays produced to date, winning a number of prizes in the process. I interviewed him ahead of his upcoming appearance at Bare Lit Festival (with Megaphone tutor Catherine Johnson), about, among other things, his Young Adult books, both of which are published by HopeRoad, and the Commonword Diversity Writing for Children prize – recently re-launched and open to submissions on the website: http://www.ihaveadream.org.uk/ . Peter’s depth of experience as a writer and with Commonword-Cultureword meant I was especially keen to find out his thoughts on the barriers BAME writers of children’s fiction face and how they can overcome them. 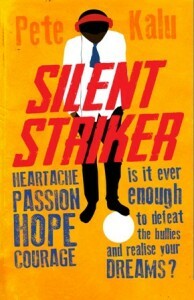 Leila: I’ve really enjoyed reading both The Silent Striker and Being Me. Marcus and Adele have such different voices; their characters really come through. It might be down to the use of first person, but Adele’s life seems more chaotic than Marcus’, I think because she has a more extroverted personality. Peter: Thanks for those generous comments. I didn’t set out to create a sense of chaos, that’s simply how the Being Me novel evolved. In some way it’s a bluff – an embracing of unexpected turns the novel took as I was developing it. It does reflect Adele’s personality well, so maybe it was inevitable. I did the same thing in the short story I had published recently in the Closure anthology, but for different reasons. Adele is definitely more extrovert than Marcus. Maybe the other difference between the two characters identity-wise is that Marcus begins with a sense of a stable core identity and HAS this sense Piccasso’d/destabilised by the onset of his deafness. Whereas Adele does not start with such a composed identity. From the get-go Adele has competing stories being told about herself – at school, by each parent, by her friends. She’s a girl. She’s a boy. She’s black, she’s white. She’s a caring person, she’s a villain. She’s unlovable, she’s adored. She’s a loyal best friend. She’s a let-down and an impostor. And Adele’s work is to figure out how to reconcile all these competing stories of herself. So Marcus and Adele have very different work to do. One is trying to rebuild his understanding of himself as having a stable core identity, the other is trying to work out what is the story or set of stories I want to tell about myself. Does any of that make sense?! It’s not something I set out to do as I was writing them, but looking at the two characters now, that’s how I feel about them. Leila: That does make a lot of sense. Marcus is centred in a way that Adele isn’t. I wondered which voice you enjoyed writing most. Peter: They were both a challenge. I enjoyed writing particular scenes. 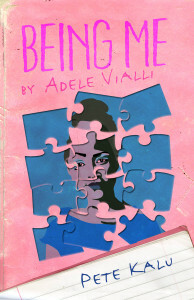 The scene where Adele spends the night in the Adenuga family’s spare room listening to all these strange noises and movements, that was fun to write. The Marcus moment where he objects to his uncle being buried with Marcus’ favourite football and his mum faints as he scrambles after it was a highlight for me. There’s usually also some key emotional scene or moment in each book that I wouldn’t say I enjoyed writing, but which mattered a lot to me. More generally, I had such a great bunch of writers around me giving me feedback for both books and I enjoyed meeting up with them and bouncing ideas back and forth. I’ve not answered the question have I? I can’t choose! Leila: Was there a particular reason to write Silent Striker in third person and Being Me in first? Peter: I was aware that Marcus’ story was in parts autobiographical so I wanted to ensure I didn’t under-distance the space between author and character. To fend that off, I placed the Marcus story in the third person and used the past tense for it. Those choices flip for the Adele story – she’s in the present and in first person. I wanted Adele to be the unreliable narrator of her own story. The spaces between what she thinks is going on and what others – including readers – think might be going on interested me. I decided that was best done in first person. Then for speed and immediacy the present tense. Again, I might be rationalising. I probably make these choices intuitively. Leila: The voices in both novels are different, but feel really realistic. I feel as if I could hear them on the back of the No 50 bus any day after school lets out! I wonder why there aren’t that many voices like this in children’s literature. Peter: Not enough published writers are catching those No 50 buses! In my area it’s the No 192 that’s legendary. Dropping the metaphor, I guess few working class writers break through. Mainstream publishing is run by the middle classes and they choose books for their imagined readership which of course means a reflection of themselves. At least that’s my impression. I recently opened up some YA books in a Manchester Waterstones (so serving a population of high cultural diversity). And randomly chose some books that looked as if they were set in the ‘now’. Overwhelmingly, they featured middle class protagonists. Leila: What was your own journey to publication like? Did you try many publishers before finding the right one? Peter: The book was part of a project with my writing buddy, Tariq Mehmood who wrote You’re Not Proper at the same time that I was writing The Silent Striker and Being Me (I write faster than him!) We would meet up several times a week and swap notes. The journey to his kitchen and back those mornings was invigorating. While writing, I’d heard some of what Malorie Blackman said at a writing conference about how black writers break through. So rather than approach a mainstream publisher, I went straight to Hope Road: I knew they had a commitment to diverse writers. Leila: And what are your writing goals for the future? Peter: Apart from another CYA novel (featuring zombies! ), I’m working on a crime novel. And completely unrelatedly, I want to write a novel in the way that visual artists produce collages, but I’ve not figured out the techniques needed yet. Leila: Can you tell me a bit about Commonword and Cultureword – how did you come to be part of these organisations, and where did the idea for the Diversity Writing For Children prize come from? It’s great to see it relaunched, by the way! Peter: I got the writing bug after reading Alice Walker and Maya Angelou in the 80’s. I went to the Moss Side Write workshops that had been set up by Commonword-Cultureword, where I met the legendary, Lemn Sissay. My involvement kicked off from there. The Diversity Writing For Children prize came about through schools telling us there were no books with BAME characters in them, no books that reflected their classrooms. The more we looked into it, the more startlingly apparent this absence. The prize does something to tackle that. Peter: Two arguments tend to surface. First, white children don’t feel comfortable having to read about the UK through the eyes of black characters. I simply disagree with that – it’s not what I’ve found. Second, parents – who buy the books – don’t feel comfortable buying such a book (approx 40% of buyers of YA fiction are actually older adults who simply enjoy the genre). There’s some truth in that. It’s well known for instance that mainstream publishers for a very long time avoided putting a black kid’s face on the cover of a YA book as their marketing departments told them it would inhibit sales. As writers in command of our craft there are solutions to that white ‘we don’t feel comfortable’ problem: exotifciation, omission, ellipsis, inversion, exfoliation. In non-technical terms, add a major, heroic white character, reduce cultural friction, downplay division, celebrate collaboration, fly into fantasy, erase the blackness, write under the radar, at least make your book a black-white two-hander. These solutions can work but at times can feel soul destroying for a BAME writer. I prefer not to craft something that is guaranteed to make white people comfortable, but instead to allow they themselves address that issue of why they are uncomfortable (or, to simply not be published). The world’s changing. Heterogeneity is growing. Those who ignore it or oppose it are like King Canute trying to turn back the tide. Publishing, including YA publishing, in the end will embrace it, probably when it hits their cash tills. Leila: I’m interested in how the conversation around diversity in children’s literature plays out in the USA as well as in the UK (for example, A Birthday Cake for George Washington). What do you think the differences and similarities are between the USA and UK children’s publishing industries and how they include (or don’t) BAME writers? Peter: The commentator, Paul Gilroy described Britain as suffering from colonial amnesia. The most barbaric events of the British colonial era didn’t happen on the landmass of Britain so that amnesia is easier to sustain. The USA has no such distancing. Plantation slavery is a fraught part of USA history and happened on American soil. Yet the Washington book news story showed the USA was giving amnesia a good go. The demographics in UK are different: a higher South East Asian population and, I believe, a greater ‘mixed heritage’ population. As far as I can tell there has been no hard, statistically significant research done in the UK but the anecdotal evidence is similar to that of the USA. Yet it’s not all bleak. As in the USA, there are signs of improvement. My impression is that the general population is way ahead of the publishing industry. If I crystal ball gaze, then my guess is that ventriloquism –getting white writers to depict black lives – will be the prominent in the first wave of change, to deal with that ‘comfortableness’ issue. Simultaneously more BAME writers will get taken up, though not at a speed to frighten the horses. Finding publishers who will break cover and take a risk is the game. Of course, once that risk makes some publisher big money, suddenly every mainstream publisher in the land will follow suit, perhaps as a new fad. The publishing industry is not an island. It sits within society itself and so there are limits to how fast things can progress in publishing while the (older) UK white population keeps up its postcolonial melancholia, its longing for a mythical white Britain. Many thanks to Peter Kalu for this great interview, which I think is full of insights the mainstream publishing industry should benefit from – and do read his excellent books!